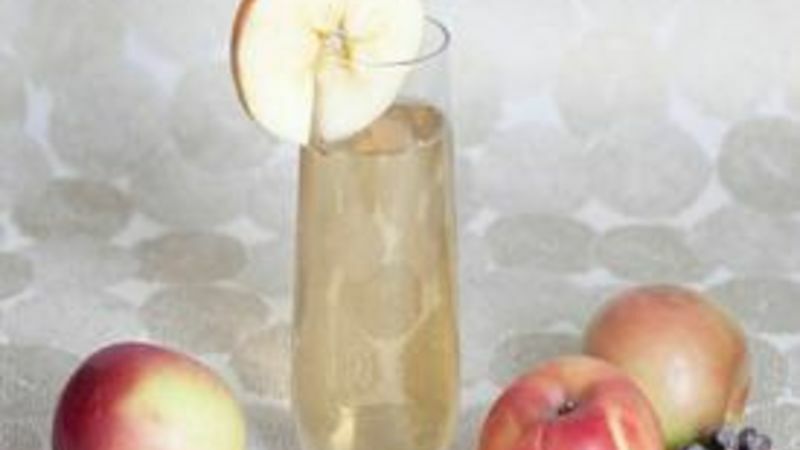 Add the champagne and apple juice into a champagne glass. Stir in the sugar, until dissolved. Serve with an apple slice on the rim. Champagne (and its cousin - sparkling white wine!) is the symbolic drink of celebration! Champagne conjures up special thoughts of elegant parties, holiday joy and celebrating victories. It’s sophisticated, but yet so easy to grab a chilled bottle, pop the top off and serve in dainty Champagne flutes. You can’t go wrong with the “bubbly,” and almost everyone loves it. This year, instead of the classic Champagne drink, try one of these five simple ingredients to make it an extra special holiday treat. They are an effortless addition that enhances this classic drink with a subtle hint of flavor and a touch of sweetness. Around the holidays I think of apples and the delicious smell they add to food, especially when baked! So the idea of Champagne with a splash of apple juice made my mouth water. Just a small hint of juice is all you need to spruce this drink up. Garnish the rim with an apple slice for some festive flare. If you want to add a kick to your Champagne, this is the perfect concoction. The fresh squeezed lemon juice gives a bit of a tart flavor, and the gin definitely adds a kick to the cocktail. The sugar and cherries really ramp up the sweetness. All together, the flavors make a great aperitif! St-Germain is a refreshingly delicious Elderflower-flavored liquor that actually comes from the Elderflower Blossoms! How cool is that? A dash of this goes perfectly in a glass of Champagne, adding a small hint of floral. Garnish this with raspberries, blueberries, cranberries or pomegranates. We all know pomegranate is good for you, so why not add a healthy twist on a traditional drink? Pomegranate is also very festive to use during the holidays, and dresses the drink up in a nice red color too! Garnish it with pomegranates or raspberries. This drink has some kick and will get the party started! It has a delightful fragrance and adding a ½ ounce of raspberry vodka adds a berry twist to the drink, perfect for any holiday party!